The youngest member of the family is Server Timing API which allows communicating the server performance metrics to the client. 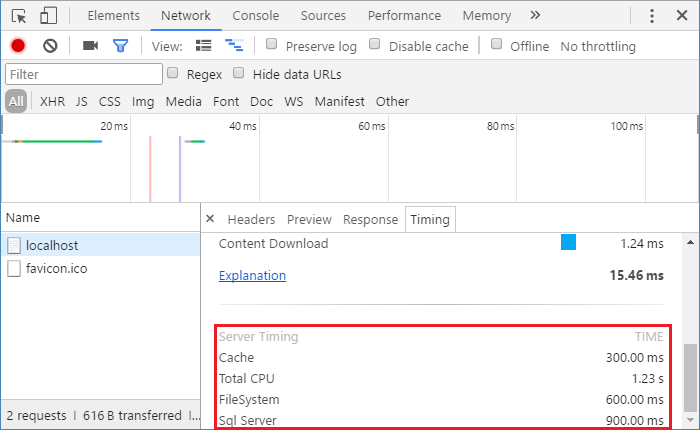 The API is not widely supported yet, but the Chrome Devtools is able to interpret the information send from the server and expose it as part of request timing information. Let's see how this feature can be utilized from ASP.NET Core. It is important to remember that it is the server who is in full control of which metrics are communicated to the client and when, which may mean that the middleware (or metrics gathering) should be used conditionally. I've made all the mentioned here classes (and some more) available on GitHub and NuGet ready to use.